Even when these promotional pens are just lying there on a desk, on a table, or by the phone, they are quietly advertising your business day and night to all who see or use them. Of course, beyond boosting a business or organization, you can also imprint these custom pens with about anything you can think of, from someone's birthday party to an important event. Whatever you're promoting or celebrating, where else can you get so much bang for your promotional buck? Inexpensive-but-effective, the customized promotional stick pens from Promotional Pen Store are the gifts that keep on giving. For less than the cost of a single postage stamp, you can keep reminding your customers of your business and the pleasant experience they had with it every time they write a note, a letter, a shopping list or just about anything else. If you're looking for a personalized stick pen, we have a big variety of imprinted pens to fit your needs at a low cost. In fact, thanks to our quantity discounts, the more you buy, the more you save. 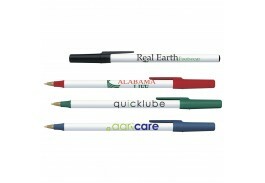 Although you'll save money with our budget customized promotional stick pens, you won't be skimping on quality. These pens will last, keeping your own name out there where it belongs, in front of the public for a long time. We stock our promo stick pens in many colors and styles, so you can find exactly the right ones to fit your budget as well as your marketing needs. In addition, you get your choice of many beautiful fonts for your custom message, further letting you put just the right touch on these pens so you can make them your very own.